Chicco’s Radio Control Ducati Motorcycle is modeled after Italy’s Hi-Performance Ducati 999 Superbikes. The remote control is shaped like a set of handlebars and moves the motorcycle in four directions. The Radio Control Ducati Motorcycle also features speed control and even authentic Ducati sounds. 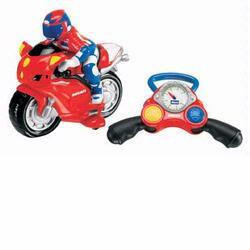 The Radio Control Ducati Motorcycle will help improve your child’s handling skills and coordination.